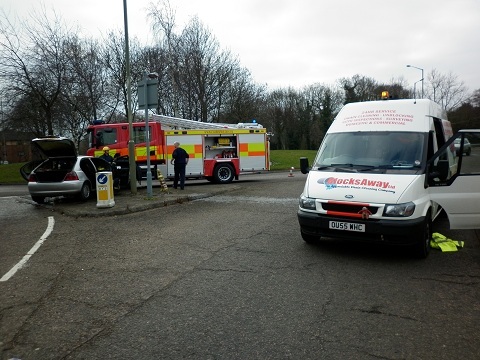 As Steve was driving to an emergency drain clearing job in Peterborough along Thorpe Rd. early on Saturday morning 29th January, he noticed 2 ladies suddenly jumping out of a car at a junction, which was clearly on fire. To the amazement and heartfelt gratitude of the shocked and shaken ladies he immediately pulled up alongside and was able to put the fire out with the BlocksAway high pressure water jetting machine which he always carries in his van. The police and fire service, who arrived shortly afterwards, were most impressed! BlocksAway – The 4th Emergency Service!